THE TIME OF THE WOLF is a dramatic story of love, hate and war placed in the shadow of the Second World War. The world is burning, and evil is spreading - but in Stockholm, Sweden, Magdalena Hedlund and her brother Nils have just started to get somewhat used to their new found wealth, and are trying to build their lives and careers. But it is soon clear that no one can escape the repercussions of the gruesome war, and their sense of justice forces them to help those in need, whichever way they can. 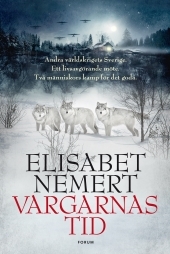 But even in the face of pure evil, love will also find a way and Magdalena meets the man she is destined to be with, Carl-Magnus Rytterholm, while searching for three Finnish children who are lost war refugees. Their encounter sets many things in motion, and their love, courage and compassion will change the lives of many. THE TIME OF THE WOLF is about finding you inner strength and the courage to stand up for the things you believe in. And about holding on to what you know is right and the people you love, come what may.